Crufts 2019 got off to a roaring start today, with 4,449 dogs entered in the conformation showing alone. Our first Group winner was the Irish Water Spaniel, SH CH GLOI DONN ALL OR NOTHING AT STANEGATE, who beat 38 other IWSs and 31 Bests of Breed to earn his place in the Best In Show final on Sunday. Known at home as Luther, he is owned by MRS J L CARRUTHERS. Reserve in the Gundog Group went to the German Wirehaired Pointer,SH CH/DUTCH CH ESMEE DRAGON FROM RHONA’S HOME AT BAREVE WW18 (IMP NLD). 3rd was the Golden Retriever – beating the day’s highest entry of 537 – while the Spanish Water Dog came 4th. The smallest entry in the Group was the German Longhaired Pointer , with 13 individuals. The Korthals Griffon won the AV Imported Register class. You can find all of our photos from Gundog Day at Crufts 2019 here. It was a good day for the VNBs in the Main Arena, as the Irish Water Spaniel took the Group. Earlier in the evening, an English Toy Terrier , Witchstone Tommy Hawk at Richpin, won the Junior Warrant competition. This was also the day for the Vulnerable British & Irish Breeds competition final. Although only 14 out of the 28 eligible breeds were represented today, they all enjoyed their moment in the spotlight, first during the pre-judging, and then in the big ring. 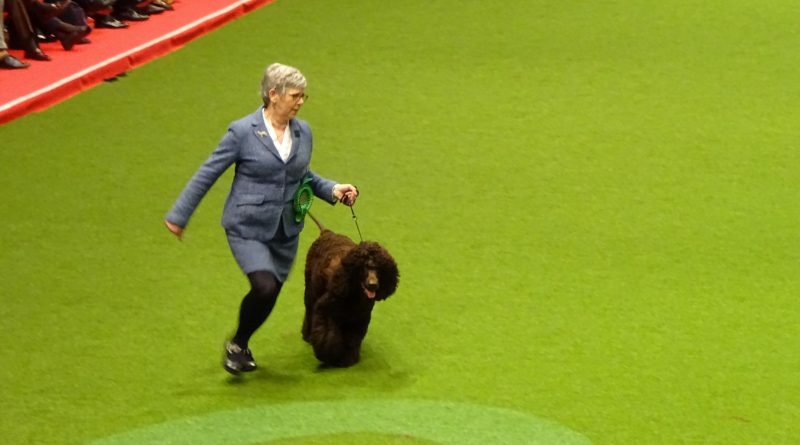 The winner was the Skye Terrier, CH BRAKEMILL BARNUM ShCM, with the Curly Coated Retriever in Reserve. You can find all of our photos from the VNB competition here. The Irish Red & White Setter, SH CH ALANEA SUMMER COTTAGE, represented her breed in both the VNB competition and the Group, as did the Irish Water Spaniel. Not content to let the Irish breeds take all the limelight, the Welsh Springer Spaniel fancy organised a gathering of 200 of their breed, to call on the Welsh Assembly to ban third party puppy sales, as ‘Lucy’s Law’ has done in England. An Old English Sheepdog from Hungary, Bottom Shaker Zephyr Dream, won the Eukanuba World Challenge. Reserve was the Grand Bassett Griffon Vendeen, Frosty, who qualified when he won the World Dog Show in 2018. Crufts 2018 Best In Show winner, Tease the Whippet, also competed and was shortlisted, but did not place. Outside of the ring, Channel 4 have announced that they have extended their broadcast deal with Crufts until at least 2022. Visit the Crufts YouTube channel for all the video highlights.